Conventional wisdom tells us that windows and doors are responsible for most air loss in a house, but conventional wisdom isn’t always wise. In fact, the most significant source of air leaks is usually a network of hidden cracks, chases, and penetrations that add up to the equivalent of one or two open windows. A steady exchange of air is essential for indoor air quality – the accepted standard is one complete exchange every three hours – but that kind of excessive air loss means you’re wasting energy by heating air that will soon be outside your home. 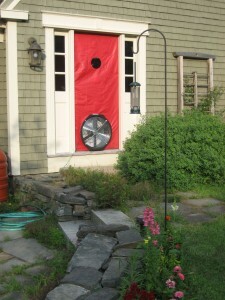 A frame with a flexible panel that holds a large calibrated fan is installed in an exterior doorway. All other exterior doors and windows are closed, interior doors are opened, ashes in woodstoves and fireplaces are covered, and dampers are shut. The calibrated fan is slowly turned up until the pressure difference between inside and outside reaches a specific target – generally 50 Pascals. A manometer measures the airflow required to achieve this pressure difference and reports it as cfm50 (cubic feet per minute at 50 Pascals). Since it takes more airflow to maintain the pressure difference in a leaky house, this measurement indicates the home’s airtightness. Airflow and building volume are used to calculate ach50 (air changes per hour at 50 Pascals). Since this metric has been normalized for building size, it can be compared to other houses and standards. It also indicates how close a building is to the accepted standard of one complete air exchange every three hours. Blower door testing gives homeowners and Energy Advisors a big picture understanding of air movement in a house. Since the pressure difference exaggerates air leaks, the test also helps Advisors locate air leaks, especially when combined with infrared analysis. A final blower-door test at the end of the project confirms the improvements.